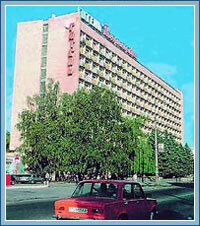 The three-star Dnipropetrovsk Hotel (11 floors, 312 rooms) was built in 1968 and reconstructed in 1998. It stands in the city centre close to the Dnepr river and the Circus, in 10 minutes from the Drama Theatre named after T.Shevchenko. All the rooms qualify for the international "luxe" hotel standard. This means that the rooms have high-class furnishing, four-channel radio, television, refrigerator, an individual fire-safety system, highly efficient air-conditioning, furnishing fabrics of exceptionally fire-proof materials telephone. The hotel's guest service operates day and night. Airport - 20 minutes. Railway station - 10 minutes. THIS PROGRAM IS THE SOLE PROPERTY OF DNEPROPETROVSK HOTELS AND MAY NOT BE COPIED IN ANY WAY OR FORM WITHOUT EXPRESS PERMISSION FROM DNEPROPETROVSK HOTELS.